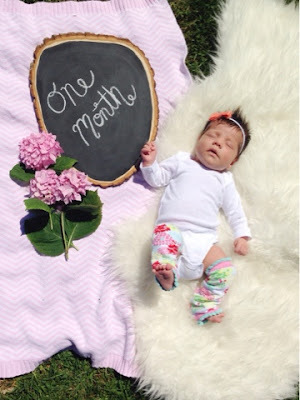 Pipers one month post is a little late, since she is the second child and I figured I would adhere to stereotypes. Just kidding, I have actually been waiting on that slab of wood for her photo. But in all seriousness the first month of Pipers life has just flewn by and I can not believe how well our family has adapted. Still wearing newborn for both. Piper loves watching her big sister Lilly, sleeping on Mommy's chest, her Mamaroo and being in the sling. Piper gets angry over mommy trying to give her a pacifier, anyone besides Mommy holding her, and being in her car seat. Piper is the best sleeper ever. She goes to bed around ten or eleven and doesn't wake up again till around four or five to eat. After she eats she goes back to sleep and doesn't get up till nine. With Daddy home the first month we were able to hang in bed and get lots of rest. I am pretty sure Piper is going to outgrow Lilly with this appetite. I feel like we are constantly nursing but I couldn't be happier. Breastfeeding is off to a smooth start and I am hoping it continues that way. 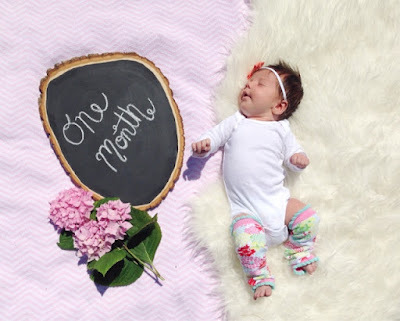 This month Piper had her first trip to the farmers market and the beach, went to her first restaurant, she was here for mothers day with me, and we put her first cloth diaper on.